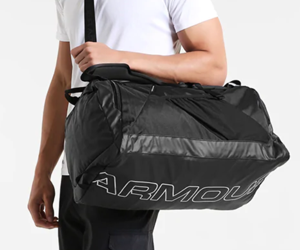 Whether you are looking for a new duffle bag to tote your workout gear to the gym or a bag for carting around essentials during a weekend trip, finding the best men’s gym bag is an important task. There are a plethora of materials and finishes to select from as the industry continue to grow and develop. As smart tech continues to advance, gym bags will also continue to evolve. As a result, finding the best men’s gym bag for your needs has become an even more difficult task. We have tested the top ten men’s gym bags and created reviews to help you sort through the features you need and those that are less necessary. We gained so much new knowledge regarding workout bags that we have also created a helpful buyer’s guide to assist in demystifying the purchasing process. Let’s take a closer look at our favorite men’s gym bags. How Do I Pick the Best Men’s Gym Bag for my Needs? 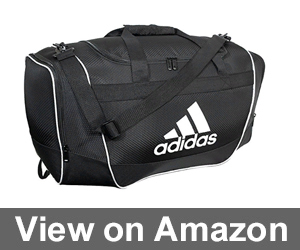 The Adidas Diablo Duffel Bag is somewhat smaller than the oversized duffle bags you may be used to. It measures in at eighteen and a half inches in length, eleven inches in width, and ten inches in height. Our testing team members were able to comfortably carry extra shoes, clothes, and a towel easily with the Adidas Diablo Duffel Bag with no issues whatsoever. 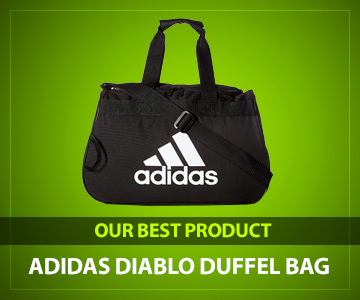 The Adidas Diablo Duffle Bag comes in standard black as well as some other fun colors such as red, aqua, and blue to suit any personal preferences. 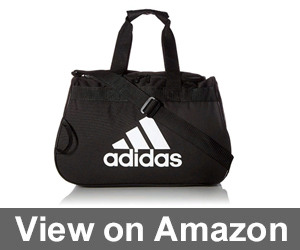 This gym bag has an adjustable shoulder strap to allow you to customize the fit and length. The zipper is very sturdy and will last for a very long time. 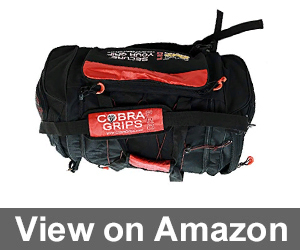 The Grip Power Pads Bodybuilding Sport Large Embroidered Gym Duffle Bag is like getting two gym bag systems in one. The bag can be used in the traditional sense by using its two carrying handles or an adjustable shoulder strap. You can also utilize the heavy-duty double straps to the convert the bag into a backpack for maximized comfort. The Grip Power Pads Bodybuilding Sport Large Embroidered Gym Duffle Bag features a larger main compartment as well as left, right, and front zippered compartments so you can safely carry anything and everything you will need. The bag measures twenty-six inches wide by one foot in both height and depth. Our testing team was astounded by not only how much this gym bag can hold but that it safely contains wet items and keeps them from coming into contact with your dry items which is terrific news for swimmers and those who love to sweat it out during workouts. 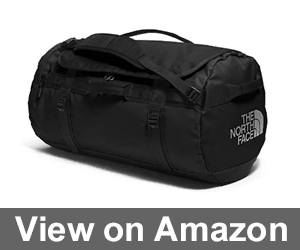 The North Face Base Camp Large Duffel offers a men’s gym bag selection for individuals that love exploring the many different facets of outdoor activities. This option from North Face is extremely versatile and moves effortlessly from the gym to camping to mountain climbing. Our testing team was shocked at how much gear this bomber of a bag can easily accommodate making it a terrific option for anyone that flies or commutes regularly. The North Face Base Camp Large Duffel includes a zippered mesh pocket perfect for smaller valuables. Each zipper on the bag is highly durable keeping your belongings safe. 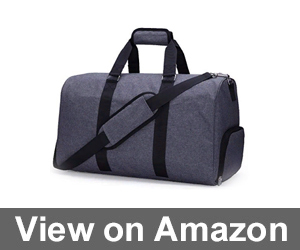 The bag itself is extremely durable and well-constructed making it a terrific choice for working out and traveling. The Pacsafe Metrosafe Anti-Theft Backpack LS350 offers a perfect solution for anyone that wants to work out before, during, or after their day at the office. The bag is styled as a traditional backpack. What sets this option apart from others is its anti-theft measures which include lockable zippers, material that is cut proof to prevent pickpockets, and an RFID pocket that blocks identity thieves. The Pacsafe Metrosafe Anti-Theft Backpack LS350 earned high marks from our testing team members that need to carry their laptop, tablet, or other electronic essentials as they travel to the gym or commute to and from work. The shoulder straps are very comfortable thanks to padding that has also been placed along the back to prevent pain or injury. With the threat of identity theft or losing your laptop being such a crucial concern in today’s day and age, the Pacsafe Metrosafe Backpack is a lovely option to protect yourself. 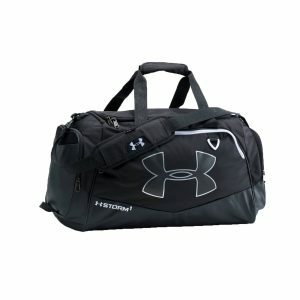 The Under Armour Unisex Isolate Duffel Bag offers a wonderful way not only to transport your workout gear, but is extremely helpful for doing laundry or taking a quick trip home to see your folks. The bag is eye-catching thanks to its bright blue 600 denier fabric and a bright pop of neon yellow-green for the strap. The shoulder strap is both adjustable and padded to provide maximum comfort and strength. 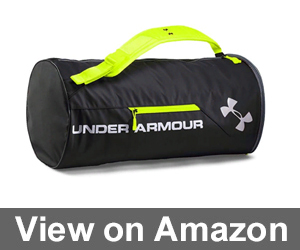 The Under Armour Unisex Isolate Duffel Bag features a large main compartment that easily fits many items. Several members of our testing team loved using this bag to assist in transporting and doing their laundry. As a result, this bag would be a lovely choice for college kids or anyone that travels frequently. If you love playing golf and are in need of a fantastic bag that assists you in towing your gear look no further. The Nike Sport III Golf Duffle Bag has been fitted with a specialized, vented compartment for your golfing shoes or your favorite sneakers. There are plenty of spots to stash all of your essential items while you work on your game. 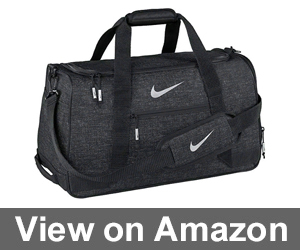 The Nike Sport III Golf Duffle Bag has dual handles that can be strapped together for ease of transport. The bag also has a shoulder strap that is both adjustable and detachable to make carrying the bag easier and more comfortable. Our testing team really enjoyed using the bag, and several team members noted that it dries quickly while keeping the items inside dry if you are caught out in the rain making it a durable choice. The Carhartt Legacy Gear Bag has been meticulously crafted from rugged materials. The bag features a durable, water-resistant Rain Defender to keep it and its contents dry and safe. The base of the Legacy Gear Bag features Duravax, a very strong and abrasion resistant material. The Carhartt Legacy Gear Bag was deemed to be the heaviest duty option by our testing team. Our team members were especially rough on this option to test how well it holds up, and we were pleasantly surprised that it continued to look brand new despite the wear and tear we subjected it too. This bag would be a wonderful choice to double as a gear bag for outdoor activities such as rock climbing in addition to being a solid gym bag option. 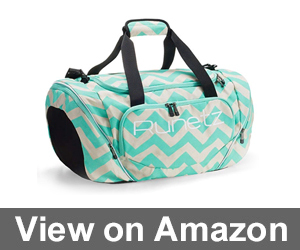 The Runetz Gym Bag is a lovely budget-priced option for anyone needing a stylish and functional gym bag. The bag is available in several colors and prints. Our testing team liked using the bag not only to cart around workout gear but as a weekend trip bag as well. This gym bag offering from Runetz features an adjustable and detachable shoulder strap to customize how you carry the bag. We loved how lightweight this option is and how durable the bag is. A ventilated pocket makes carrying wet or sweaty clothes easier with less risk of mold or mildew infiltrating your clothing, making this a great option for humid climates and swimmers alike. Adidas pops up for a second time on our top ten men’s gym bag list thanks to this exceptional option. The Adidas Defender II Duffel Bag earned the highest marks with our testing team due to its excellent design and durability. The bag features a very spacious main storage area in addition to two side zippered pouches that make getting and staying organized a breeze. The Adidas Defender II Duffel Bag has been created from reinforced ripstop polyester material making it both light and long-lasting. The bag also has a lifetime guarantee to hold up to heavy use. The bag fits wonderfully in your gym locker or easily doubles as luggage for shorter trips. The Mier Gym Duffel Bag has been carefully designed with traveling professionals in mind. The bag features a dopp kit to house your essential toiletry items. There are plenty of pockets to store your valuables while keeping your organized as well. The Meir Duffle Bag has a dedicated compartment to safely housing your footwear. 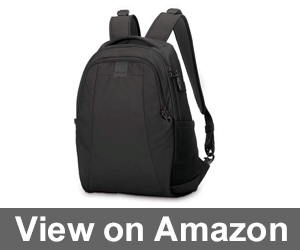 It is very comfy to carry and has an adjustable shoulder strap that has been padded. This option doubles as a carry-on bag making it a wonderful selection for traveling professionals and gym-goers alike. A gym bag is more than just an accessory. The right bag will make your commute to and from the gym easier and can help you to be more organized. Many bags can also be used for other purposes such as traveling or commuting to work. Finding the best men’s gym bag for your needs can quickly turn into a headache. There are thousands of gym bags available in every imaginable color, shape, and size. We created this buyer’s guide to assist you in understanding which features are essential and which you can go without. Let’s get started! Understanding the different materials involved in crafting your new gym bag is key to using it properly. Different materials have different requirements for cleaning and upkeep. Let’s get a better idea of which materials are better for use in a gym bag. Canvas is a lightweight material. It is less expensive than other materials and makes a lighter, easier to handle bag. Canvas is created from cotton or linen fibers which are woven tightly together. The result is a light fabric that is durable and easy to care for. Nylon is one of the least expensive fabric options utilized in the creation of duffle bags. Nylon can be made in many different colors and textures to design an aesthetically pleasing product that is easy to care for. On the downside, nylon can rip easily and may not be as long-lasting as other materials. Will your new gym bag be pulling double duty as a carry on or travel bag? If your answer is yes, you may want to go with a more durable option since it will be used more often. Many gym bags include a separate pouch or kit to store toiletries, which is another very helpful and useful feature for frequent travelers or those individuals facing long commute times. There are many different styles relied upon by designers. Here is a detailed explanation of the various styles that are the most popular and commonly used in crafting gym bags for men. Tote Bag: A tote bag usually has two straps and is carried by one hand. The bag may or may not have a way to enclose the top to prevent your items from falling out. This type of bag is great for shorter distances or for also using when grocery shopping. If you are looking for the best men’s gym bag for your needs there are a few key points to consider. Let’s explore these key features further. Gym bags are made in so many different styles that it can quickly become cumbersome to sort through the plethora of options. Narrowing down which styles you like best allows you to focus on the task at hand. If you know that a backpack style bag would work best for you, then search those bags rather than looking at styles you do not like or that do not fit into your lifestyle. If you live in a rainy area or you plan on swimming often, you will want to select a fabric that does well when wet. You can also look into options that have been specially treated to withstand water or mold. Additionally, you may want to explore the idea of treating the fabric yourself with something like Scotch Guard. This action can help to extend the life of the bag while ensuring your items stay safe and dry. Pricing is always a top concern when selecting a new gym bag. You may be tempted to select a cheap option in order to save a few dollars. If you use the new gym bag heavily, a cheaper version will wear out faster leading you to shell out even more money for a new bag. Selecting a well-made option that fits in your budget will help to ensure you aren’t wasting money. Men’s gym bags have come a long way. Finding the best gym bag for you and your needs no longer needs to be an unenjoyable ordeal. Understanding the important design elements while keeping your preferences, needs, and budget in mind will expedite the process. 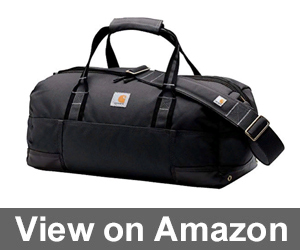 We hope our reviews and buyer’s guide for the top men’s gym bags were helpful and interesting. Hearing back from our loyal readers is our favorite part of the day. Leave us a comment below with your favorite men’s gym bag styles and any tips you’d like to share for keeping your workout gear organized. Adidas is my favorite brand. I can’t say that the presented on this page bag is the best one, but all of them are of good quality. Of course, sometimes you pay too much for the brand, but I’m ok with that. My Adidas bag still looks good, however, I’ve been using it for 3 years. Just be careful buying Adidas. There are a lot of fakes on the market, that’s why I prefer purchasing brands which aren’t so famous. I thought I bought a great sports bag until I understood how much I need some interior pockets to keep everything in order. I don’t know what to do, maybe I should buy another bag or carry this one for a couple of years and then change? North Face Base Camp Large Duffel is the most durable gym bag I’ve ever had! It went through 3 gyms in different countries and cities, and I was always happy to carry it with me. My husband likes the last gym bag I’ve presented him on his birthday. It was NIKE Sport III Golf Duffle Bag. As I can see, he uses it without any problems, it’s durable and still looks good no matter he goes to the gym quite often.